The critically acclaimed debut from Alex Gilvarry, a darkly comic love letter to New York, told through the eyes of Boy Hernandez: Filipino immigrant, glamour junkie, Guantánamo detainee. Alex Gilvarry's ambitious second novel, Eastman Was Here, will be on sale in August 2017. Alex Gilvarry's widely acclaimed first novel is the story of designer Boy Hernandez: Filipino immigrant, New York glamour junkie, Guantánamo detainee. Locked away indefinitely and accused of being linked to a terrorist plot, Boy prepares for the tribunal of his life with this intimate confession, a dazzling swirl of soirees, runways, and hipster romance that charts one small man's undying love for New York City and his pursuit of the big American dream—even as the present nightmare of detainment chisels away at his vital wit and chutzpah. 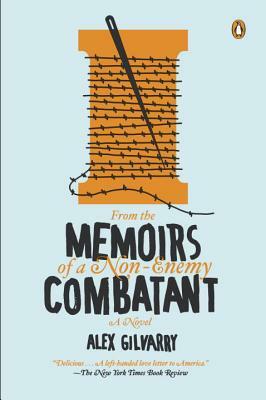 A New York Times Editor's Choice, From the Memoirs of a Non-Enemy Combatant unveils two of America's most illusory realms—high fashion and Homeland Security—in a funny, wise, and beguiling, and Kafkaesque tale for our strange times. Alex Gilvarry was born in Staten Island, New York in 1981. He is the author of From the Memoirs of a Non-Enemy Combatant, winner of the Hornblower Award for First Fiction and Best New Voice 2012 by Bookspan, and was selected by the New York Times as an Editor's Choice. His second novel, Eastman Was Here, will be published by Viking in August 2017. He is a National Book Foundation 5 Under 35 honoree and has received fellowships from the Harry Ransom Center and the Norman Mailer Center. His essays and criticism have appeared in The Nation, Boston Globe, NPR's All Things Considered, and many other publications. He is a professor at Monmouth University where he teaches fiction.